GSMArena team, 17 July 2016. Samsung's J-lineup is being fully renovated and the 2016 badge on the model name implies meaningful updates - albeit subtle, which is understandable. After all, this is the Koreans' economy class of smartphones. But the series is obviously important enough for Samsung to even add new digits. The J3 (2016) here is in a slightly different boat from its siblings. The J5 (2016) has its predecessor from a year ago, the same goes for the J7 (2016), even the basic J1 (2016) and J2 (2016). With no J3 from last season, Samsung is clearly enriching the selection and it's worth noting that there is a Galaxy J3 Pro in existence as well, but it seems intended for the Chinese market only. That one is technically a 2016 model too, released a mere month ago. Anyway, the J family has proven quite popular among value-conscious smartphone users in developing and mature markets alike. The new generation has a solid base to build on, and that definitely applies to even a fresh newcomer such as the Samsung Galaxy J3 (2016). One thing that Samsung did well to achieve is a full house of display sizes with the J series, a point that is still incredibly important. Whatever your needs and preferences may be, Samsung has you covered with a "J" device. They all come with the company's trademark Super AMOLED panel from as small as 4.5" WVGA in the J1, to 5.5 HD in the Galaxy J7. However, the allocation of features and overall performance, as well as battery life, isn't quite as linear across the lineup. The power-efficient 14nm Exynos 7870 SoC in the J7 (2016) is obviously the most potent engine while the rest of the family is getting the likes of S410 or a budget-class Exynos. 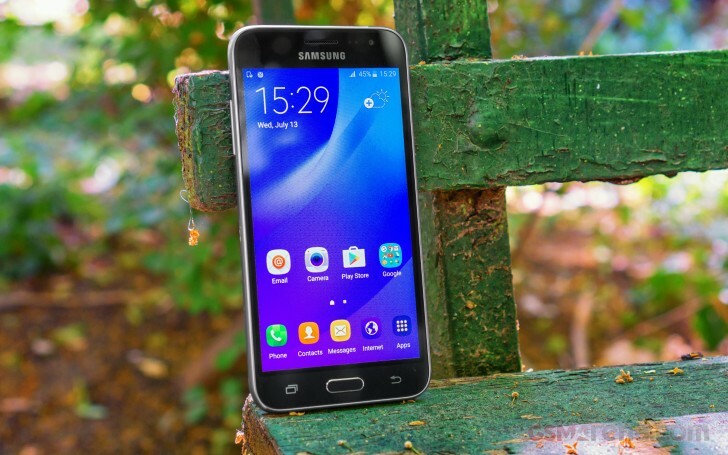 Still, the Samsung Galaxy J3 (2016) does come across as a compelling package. For around €140, you get a versatile and well-made device, with a nice and sharp AMOLED display, a decent Chinese-made quad-core SoC, 1.5GB of RAM and a surprisingly well-optimized TouchWiz that makes the most of them. At least, that's what it seems from the surface. Well, join us as we go deeper than that.